Home > Wolfgang Product Line > Wolfgang Concours Series Trio 2 - Your Choice! 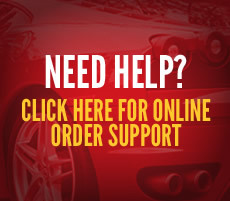 Choose three products and save BIG! 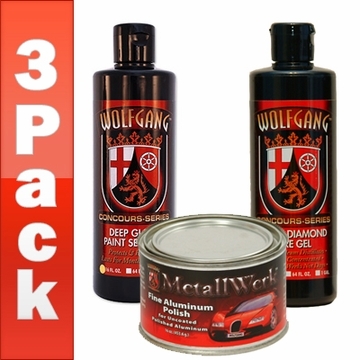 Select any three Wolfgang car care products from the list below and save up to 30% off the retail prices! This is an excellent opportunity to stock up on three of your favorite Wolfgang products for one low price. Wolfgang Deep Gloss Paint Sealant 3.0 features fortified polymer technology. Wolfgang's German Super Polymers are fortified with more dirt-repelling power to keep your vehicle cleaner and shinier, longer. 1 Per Order. Wolfgang Total Swirl Remover 3.0 by Menzerna is an all-in-one swirl remover that finishes like a polish. Remove 2000 grit sanding scratches, oxidation, and swirls - all with one polish. Wolfgang Finishing Glaze 3.0 by Menzerna is a special gloss enhancing glaze and finishing polish that restores the maximum shine to automotive paint after compounding. Wolfgang Leather Conditioner preserves and protects leather from drying, cracking and brittleness that occurs naturally with age. Regular use of this lavish conditioner will leave your leather soft, supple and inviting. This concentrated gel applies evenly, is absorbed into the rubber, repelling UV rays, rain, and detergents. Black Diamond prolongs the life of your tires, conditioning and revitalizing them for up to two weeks, including a couple of washings! Wolfgang Elastic Poly Clay Bar is a long-lasting, reusable, synthetic detailing clay bar that will leave your vehicle smooth, shiny, and unbelievably clean. Wolfgang MetallWerk™ Aluminum Compound is a strong aluminum pre-polish that powers through oxidation and discoloration on aluminum to create a smooth, uniform finish. Ultra fine abrasives restore a brilliant, like-new shine on bare metals, chrome, and stainless steel. This acrylic metal sealant eliminates any remaining polish residue for a cleaner, clearer shine that is protected from the elements.